"Dialogic reading works. Children who have been read to dialogically are substantially ahead of children who have been read to traditionally on tests of language development. Children can jump ahead by several months in just a few weeks of dialogic reading." You can read all types of picture books when trying to implement the dialogic reading technique. However, some books already have built in prompts that help parents actively read with their children. 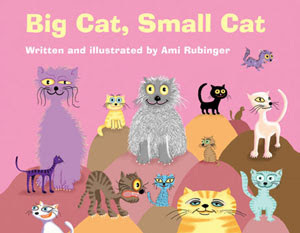 A new picture book titled Big Cat, Small Cat by Ami Rubinger is one such book. Comical pairs of felines in every shape, color, size and disposition sit on hills and fill the pages of Big Cat, Small Cat. Rubinger uses the various cats to discuss opposites. The text features short, simple, rhyming verses. Children can participate in the storytelling by listening to the rhyme and using clues in the illustrations to fill in the blank at the end of each four-line rhyme. The missing word rhymes with the last word in the second line. For instance, "This cat is dirty, this cat is clean. This cat is nice, this cat is ... [mean]." The author, Ami Rubinger, resides in Tel-Aviv and this book is translated from the Hebrew version. We have our own big cats here, so obviously my kids enjoy all books about cats. My daughter liked the fill-in-the-blank aspect of the book the best. She surprised me by guessing all the rhyming words correctly the first time we read the book together. Completion prompts are one of the five types of dialogic reading prompts to use with your children. I've read several books to my daughter where I've omitted a word intentionally and asked her what word comes next. Up until reading Big Cat, Small Cat I hadn't encountered a book that deliberately omitted words for educational purposes. The often silly accompanying illustrations helped set a fun tone to the book. We got a good laugh noting the stark opposites of the "good," white, angel cat and the "bad," black, ears-on-fire cat. The book strangely ends with a "bedtime book" message that seems out of place in a book that would normally be appropriate to read any time of the day. Here's our own silly rhyme to sum up our overall opinion: "This book contains cats; and opposites abound. Filling in the blanks, it's a fun read all-round!" Reading Rockets Article: "Dialogic Reading: An Effective Way to Read to Preschoolers"
Win a copy! Abbeville Press has kindly offered to give away (1) copy of Big Cat, Small Cat to a Brimful Curiosities reader. • Contest ends on Monday, September 21st, 2009 at 11:59 PM CST. 1st extra entry: Visit Abbeville Press and let me know the title of another children's book that you'd like to read. This looks so cute! It reminds me of the Dr. Seuss book, One Fish, Two Fish, Red Fish, Blue Fish. This book sound really awesome. I would love to have it to read to my daycare kiddos. I think that sometimes parents forget to teach their children about opposites. I would love to have the book City Mouse and Country Mouse. It's such a good story. I like the Mother Daughter Tales from Abbeville Press! Would love to read the book to my little guy! What a delightful book for a preschooler and a first grader. The Animal fables looks adorable. I love finding books that actively engage my little one, and he loves cats, so this one seems right up his alley. Thanks for the chance to enter! The Wolf and the Seven Little Goats looks great too! My son would love this book. He loves animals, especially cats. I always try to get my children engaged while I read to them. I ask questions about the story, ask them what they'd do if they were the story's character, etc. I'd love to read Princess Tales with my kiddos. We are a cat loving household so this book really appeals to me! Another book that I would like to read is Everett The Incredibly Helpful Helper! Following you on Twitter as Karenladd and tweeted here:! I totally do that leaving out a word with my boys all the time. I just did it tonight when we read, although I accidentally forgot one time and my boys for sure pointed it out. :) What a fun book. I subscribe by feed and follow. I'd definitely love "Everett, the Incredibly Helpful Helper"! The "bad," black, ears-on-fire cat is living with me now and reeking havoc on my home - lol! What a cute book! I so want this for my niece! Thanks for the giveaway. Please enter me. My son and I have been doing "fill in the blank reading" together lately. What a cute book! My granddaughter would just love this. Thank you so much! Little Red Car Gets in Trouble looks like another really fun book to read. This would be a great book for my step-daughter to read. Thanks. I think my son would be good at this. We already do a little bit of dialogic reading at home, I just didn't know that's what it was called! Plus the only cats my boys will ever get are the ones in books! I am allergic! My sons would like the Turn-the-Wheel: Fire Engine book at Abbeville Press. I am allergic to cats, so we like to enjoy books about animals we can't have. Thanks! My niece would love this book. She loves anything about cats. I can't enter, but I just had to say thanks for posting. My kids are cat obsessed. I'll have to look for this locally. Sounds like a book my little ones would love! I'd like to read "Mother and Daughter Tales" It looks to be a wonderful read! I don't know why, but both of my kids are cat-crazy! We don't even have a cat! My little guy isn't quite two, but he's very into "reading". I read to him every day and really try to allow him to be an active participant. As a grandmother, I can not have enough of these great books. Thank you for giving me the chance to win this one. This looks like such a cute book to read to my daycare kids. I have a 2 year old right now who would love this because we have cats and he's enchanted by them. This looks like an awesome book. I'd love to read it with my daughter who loves cats. We are huge readers so would love this. My nephew is crazy about cats so I think he'll be delighted by this book. I love that it lets the children guess the words. I think he would get a kick out of that too. I'd like to read Mother and Daughter Tales - Retold by Josephine Evetts-Sacker, Illustrated by Helen Cann. The artwork is gorgeous. Sounds like a really cute book. Of course the fact that we are cat owners even adds to the appeal. Definitely would be a fun book to read to my grandson. Another good one would be City Mouse and Country Mouse. This looks like a book my kitty loving preschooler would enjoy. I would love to win this for my grandsons! I have two cats and they love to play with them when they visit me! Thank you for the giveaway! I would like to read Bring On the Blue to my grandsons. My kinder kids would love this. It looks like a book children will love. I like the The Butterfly Dance. My son would absolutely love this book. He's an animal lover, especially cats. What cute little book. My boys would love to read this book! My oldest just adores kitty cats! Thanks for the wonderful giveaway! I think Everett, the Incredibly Helpful Helper sounds funny! Cute book, I would love to have it to read to my grandson. Who doesnt love a good sweet cat?!?! My gosh. I am glad I came across this book. I have not heard of Dialogic Reading before although, it makes complete sense. In a way, I have already been doing this with my children but after reading the link you posted, I am going to be more purposeful with dialogic reading - PEER sequence. This may be a great thing for my six year who has some delays. The book itself looks fabulous. A must for this house regardless if we win or not. This looks like a book my kids would absolutely enjoy. Thanks for the chance! My granddaughter would LOVE this book as she is such a cat lover!! My daughter would love this book. Thanks for the great giveaway. Another book I'd love to have from Abbeville kids is ABC Snake. Our daughter is three and is still learning her letters, but when she does start to read this would be a great book for her! She loves cats and this looks like an easy read, how perfect! My son loves cats&loves to read,so this would be great for him! My daughter loves cats, so she would love this book. Thanks! I love cats, and this would be a great way to help impart that. This book is adorable! I've not seen it before (though I'm always on the look out for kitty books because my granddaughters lov cats!) Would love to win this for them. I know a little girl who loves cats, and this would be a great gift for her! My niece, Hannah, has a fascination with cats! I always try to ask K questions when we read. It's funny, because now she is quizzing me! Went on Abbeville's site and saw the butterfly dance. My daughter loves butterflies and would find that book fascinating! I'd also like the check out "The Butterfly Dance"! We have the world's BIGGEST tomcat. His name is Romeo. My kids would love to read this book. Thanks so much! From Abbeville, I'd also like "Mother and Daughter Tales". Thanks so much! I'm a curious follower through GFC! Thanks so much! I would love to have the book City Mouse and Country Mouse. My goddaughter's first word was Kitty so I know she would love this book! Thanks for the chance! Coyote in Love with a Star looks like a great read as well! Thanks! My little grandson is such an animal lover, he'd really enjoy this! Animal Fables looks very interesting! I love it! I'd love to win it! I'm diving in to get those extra entries! Thanks for the chance. But now I see I'm too late! Oh well, that's what bookstores are for! Thanks for bringing it to my attention.